France Telecom's Orange brand is to buy a 49% stake in Paris-based internet video site Dailymotion for €58.8m (£50.8m). 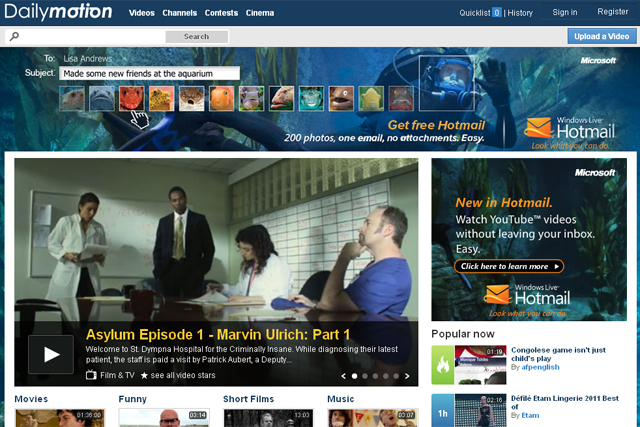 Dailymotion is often referred to as the French YouTube, and claims to be the second-most watched internet video site after the Google-owned giant. The deal will give Orange the right to progressively increase its stake to 100% from 2013, but the initial deal is expected to be signed in "a couple of months," according to both parties. Orange will have the rights to multi-screen video via Daily Motion, which will be useful in future high definition and 3D offerings. Stéphane Richard, chief executive of France Telecom-Orange, said: "This operation once again illustrates the role that Orange intends to play in the content value chain. Although we are no longer publishers ourselves, we are strengthening our position in the fields of aggregation and distribution. "We will provide our customers with an enriched and innovative video offer combining Dailymotion's know-how and diversity of content with the quality of our networks across all connected screens. "Our role is to support our customers in this digital revolution – we would like to bring them into the 'Cloud Video' world where Dailymotion is a major player." Orange claims internet users in the US spend 12-hours per month on video, and the group sees this as a growth area. In the UK, France Telecom is in a joint venture with T-Mobile under the Everything Everywhere banner. T-Mobile intends to restrict video use for users who have reached their monthly data limit. Last week Orange signed up to sponsor the Euro 2012 football championships to be held in Poland and Ukraine.